It's that time of year again! Time to pull out all of my most festive polishes and deck my nails out in every ounce of glitter I can get my hands on. Since the first option I usually gravitate towards is a red polish for Christmas I decided this year it would be fun to skip the red (not totally of course) and find some alternative color options. My number one color option for this season is a gorgeous evergreen shade like the one above from & Other Stories. I think that it is so fresh and festive at the same time. It also looks amazing with the rose gold Essie glitter (Summit of Style) ombred over the top. I usually ombre just one accent nail with glitter and find it works perfect. The Marc Jacob's color, 'Petra' is a bit unusual but absolutely gorgeous for this time of year. It's dark gunmetal color is neutral and the glitter that runs throughout it keeps it party ready. Good as Gold is one that my dear friend Jordan snagged for me this holiday season. It is quite the mix of metals (mostly gold with some bits of silver running through) so it looks amazing paired with either glitter options! I love these colors! 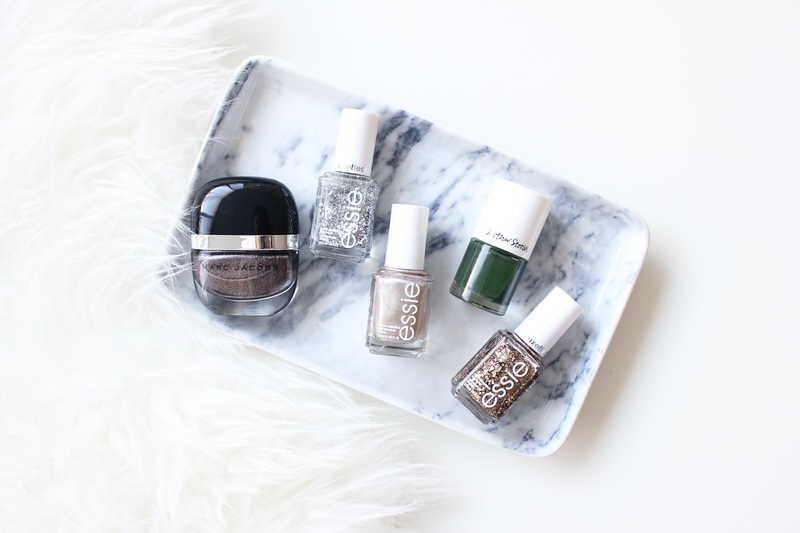 Essie's Stylenomics is what I snagged for Megan's holiday gift bag! I cant wait to see how you style "good as gold"! Stylenomics is amazing! My bottle has dried up sadly :( I need a new one!! Marc Jacobs never fail! I actually always go for a black glitter/sparkle this time of year, but I love these alternatives. Love the black glitter as well! Such a chic mani, especially for New Years!